Unbelievable! that a girl from a very common household is bringing name and fame, not only to her own family but the city, state, and the country. She is still confronting with various challenges; her being coming from a background where it is ‘awkward’ to let girls go out and venture into their desired fields, lack of facilities, guidance, and most importantly, people who still feel that it is not her ‘cup of tea’! 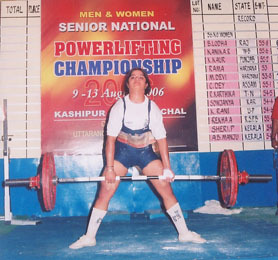 But nothing could defeat Rekha’s confidence, untiring support from her parents, and coach that made her ‘Strong’ enough to make her existence a prominent one in the world of power lifting. Her sheer dedication, passion, determination and a burning desire to prove decision of her parents to let her weight-lift against all odds pumped energy into her veins and every time, when she is to perform, she does it with grace and reaches the top of the rungs. A perfect body and an attitude that is filled with sheer professionalism is her natural instinct and you would wonder that she never undergone any professional training or groomed her for this unusual field! ‘I was washing cloths at home when my uncle, who himself is a bodybuilder, came and asked me to participate in a championship in Rampuria College. I was stunned as I never ever thought of venturing into such activities and I never underwent any sort of training! But his verdict (duly supported by my parents) that I have to participate in the championship left nothing to be decided at my end”, says Rekha Acharya. Her first attempt worth her “Strong Woman of Rajasthan” title wherein, professional and well-trained contestants from more than 20 districts participated and tried their best to bag the prestigious title in the field of power and weight lifting. And then after, she never looked back. She had found an aim for her life. With this title, she was selected for the National championship at Nagpur. But she had only ten days to do all sorts of preparations, and mental as well as physical training. But “Strong Woman” was destined to confront such tedious tasks with an ease. She shaped herself and got acclimatized in the field of power lifting so quickly to make a mark at the National level. Eight hours of rigorous physical training to get her level equivalent to the ace-lifters at the National arena resulted in bringing fortune for her. She bagged silver medal in 52 kg category by lifting 215.5 kg of weight. Her next aim was to participate in Sub-Junior Championship (U.P.). For that, she had to top the state Sub-junior competition to be selected for the championship at National level. Her commitment and burning desire to achieve what others might not even dream at her level pushed her one step further, and she bagged the awaited gold medal in the state level championship at Udaipur. Once again, she was declared as ‘Strong Women of Rajasthan’ and got direct entry to the National Sub-junior championship. Following rigorous training and increased diet to build her physique for the competitions one after another, she also gained weight. She wanted to compete in 52 kg category but she was weighing 60 kg at the start of her training. When her coach pointed that out, she showed how committed she was for the forthcoming event that would also fetch her fame and glory at National level. She did not eat anything for continuously four days and such hardship helped her reduce her weight once again to 52 kg. 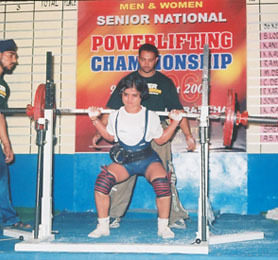 This time, she lifted 272.5 kg in her category and won silver medal. 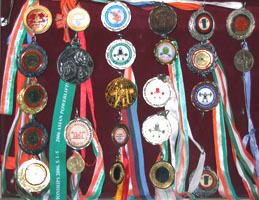 After each competition, she was marching towards unparallel achievements. Her silver winning performances at National level earned her a place in the National team to represent India in the III World Sub-junior Championship, New Delhi. This time, she got only one month to train and prepare herself for the International competition. This was the time when she had flashes of the memories of those days when people were pointing at her and her skills and even had doubts on her potential. She was playing against all odds, not only in the field but also in her general life. But her wholehearted efforts and rock solid determination were her strengths that paid her finally. Her mother supported her in all her challenging deeds and had full confidence that Rekha would make anything possible. “My mother, my backbone always prays when I have to perform, and this is her prays that make me do everything so easily” says Rekha with glistening eyes. Indeed, her mother paved a very unconventional way for her. The World Championship was a dream came true for Rekha. She won one silver and two bronze in the competition and made her parents, family, city and country proud. It was only when she was returning to hometown that people gathered for the first time at railway station and greeted her with warmth. But that didn’t make any difference in Rekha’s attitude towards her game. “I was taken by surprise by the affection of all those people who were even shouting slogan for my victorious performance in the World Championship but then I realized it was just my success that pulled them, otherwise, people were the same who once had criticized my being going to this unconventional field and pointed fingers when I was practicing with boys in gymnasiums”articulates Rekha with confidence but tears in her eyes.